It's no secret what the purpose of film posters is: to sell the movie. That shared motivation has not inhibited the variety of styles used in film posters, however, and studying a broad range of them can provide the viewer with a capsule history not only of film culture, but also of changing tastes in art and design. 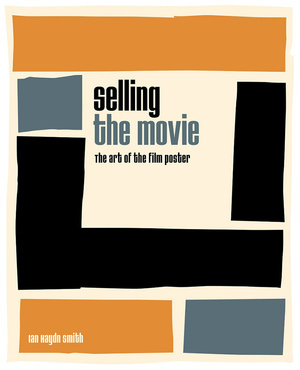 Ian Haydn Smith's Selling the Movie: The Art of the Film Poster is a well-designed, large-format (11.5" by 9.25") book that will delight both the casual browser and the serious student of film and art history, and it is most conveniently being released in time for the holiday shopping season. Smith follows a chronological approach to his subject, organizing the posters by decades from the 1910s through the 2000s, choosing particular topics to cover in more detail within each decade. He begins with a brief discussion of the advertising poster, which has been with us since at least the 15thcentury. The modern style of poster really begins in the 19thcentury, however, when the French artist Jules Chéret began to exploit the possibilities of color lithography, which allowed vivid designs to be duplicated quickly and cheaply. Other contemporary artists known for their work in posters includes Henri de Toulouse-Lautrec and Rodolphe Salis, the latter the creator of the famous 1896 two-tone poster for the French nightclub Le Chat Noir. Film posters are literally as old as film itself, with two different posters being created to advertise the first-ever screening of a film before a paying audience; the Lumière Brothers chose to use a poster designed by Marcellin Auzolle rather than one designed by Chéret for this 1895 occasion. Notably, Auzolle's poster shows an audience watching a scene from one of the shorts screened that evening (and rather inexplicably gives the punchline away), thus emphasizing the enjoyment to be had from viewing films, which were an unfamiliar form of entertainment at the time. Much of Smith's text is devoted to providing a summary of film history rather than on analyzing the posters themselves, so this volume provides an overview of the development of the film industry (primarily in the United States) as well as of the posters used to advertise films. However, each poster receives at least a brief analysis in a paragraph devoted to it. These comments are often quite insightful and tie the visual elements of the poster to developments in both the film industry and contemporary art. History and artistic analysis are well-integrated in some sections, such as Smith's discussion of the rise of the movie star and how different stars were featured in film posters. While the first film producers tried to avoid creating stars, fearing they would use their fame to demand higher salaries, the public taste for seeing their favorite actors on the big screen won out, and emphasizing the featured performers became an important tool in advertising films. Different visual approaches were adopted for different actors. For example, Lon Chaney was known for the type of characters he played and his ability to transform his own appearance, so even his masked face is obscured in a somewhat abstract poster advertising The Phantom of the Opera (dir. Rupert Julian, 1925). Lilian Gish, in contrast, was known for her dramatic talents, and posters for her films generally show her appearing in one of the film's suspenseful scenes. Matinee idol John Gilbert was known to film audiences as "the Great Lover", so posters for his films generally showed him in a romantic pose (e.g., kissing Renée Adorée in a poster for King Vidor's 1925 The Big Parade). Different approaches to advertising the films of Michael Powell and Emeric Pressburger, a.k.a. "The Archers", are also insightfully discussed, with four posters analyzed in some detail. A full-color poster for Stairway to Heaven (1946), the US title for the film released in the UK as A Matter of Life and Death, emphasizes not the film's philosophical and fantastic components, but the romance between David Niven and Kim Hunter. A second poster for the same film, using the British title, features Niven and Hunter separately, wearing thoughtful expressions, and the spot use of color within a largely black and white poster hints at the film's combination of color and black and white footage. A poster for The Red Shoes (1948) highlights the film's connections to ballet as well as its critical success (featuring the text "Winner of Three Academy Awards" plus a small image of an Oscar statuette). A poster for Black Narcissus (1947) uses contrasting colors to highlight the film's exoticism, and features only one nun (rather than an entire convent, as is the case in the film), who is made up like a movie star. If you're interested in learning something about the history of the film poster, Selling the Movie is the book for you. If you just want to flip through pages of beautiful color reproductions of movie posters, it's also the book for you. While some may quibble about which posters were included and which excluded, there are so many strong choices in this volume, and they are so intelligently discussed, that you would have to be a real curmudgeon to focus on a few points of dispute rather than the overall excellence of this volume.